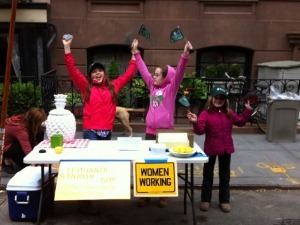 For the second year, Sigourney and Odessa Buell ran a lemonade stand during the Perry Street Fair. Odessa, Sigourney and their close friend Georgia Wallace have attended the WINGS Women of Discovery Gala for the past several years and have been so inspired by the women they've met, that this year they decided to donate a portion of their proceeds to WINGS to support their work! These remarkable young women, following in the pioneering footsteps of the WINGS Fellows, began efforts last year to establish "WINGS Girls," a junior explorers club for girls who dream about exploring the world and making it a better place through science and discovery. Thank you Odessa, Sigourney, Georgia and all of your friends for being such dedicated champions of WINGS and the WINGS Fellows! The girls were helped by some special friends, Katrina Fisher who is a classmate of Sigourney's and Su Chermayoff. They set up the stand at 8 AM and kept it open until 6 PM, when the fair closed. A long day of work, but it paid off. 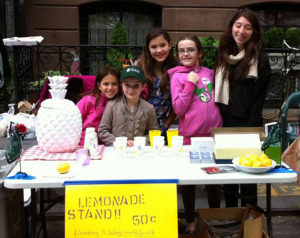 They sold 600 cups of lemonade, well done! With each sale they gave the customer a WINGS card and explained what WINGS is about. Since people often came in groups they were able to reach out to well in excess of 600 people. Here are a few fun pictures of the action! Odessa and Su making a sale! Sigourney, Odessa and Rosa explaining to customers about Wings Worldquest. Katrina, Sigourney and Odessa celebrating at the end of the day after they sold the 600th cup!